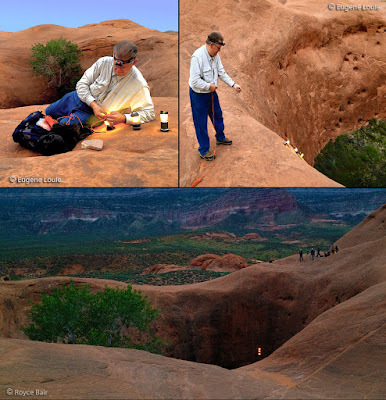 Camp lanterns cast light in all directions (omni-directional, or almost 360 degrees). 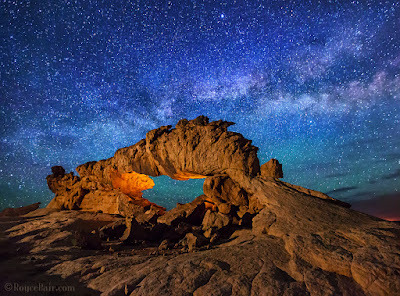 They are one of the three types of lights I discuss and demonstrate in my Milky Way NightScapes eBook. The other two are LED panel lights and spotlights. Spotlights have very narrow beams with high intensity, and must be kept moving during the camera exposure process. Panel lights and camp lantern lights are wide-angle coverage lights that can be stationary during the camera's exposure. Problems with most LED camp lanterns. There are two major problems I have with most LED camp lanterns when using them for NightScape style photography: 1.) Most LED lights are too cold or bluish. To make them usable, I usually have to wrap an orange conversion filter around the lantern. Without the filter, their output is typically between 5600º Kelvin (a little bluer than daylight) to 8000º Kelvin (very blue). This does not match the camera White Balance I like to use for starry night photography, which is between 3800º to 4400º Kelvin. 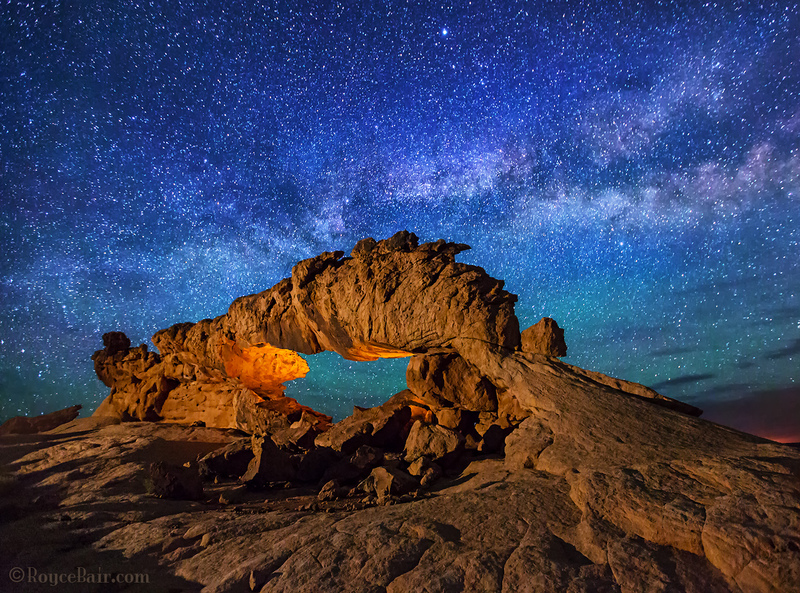 By the way, scientists have also proven that the bluish LED lights cause more eye fatigue—something to consider if you plan to do a lot of night reading in your tent. 2.) Most LED lanterns are too bright. 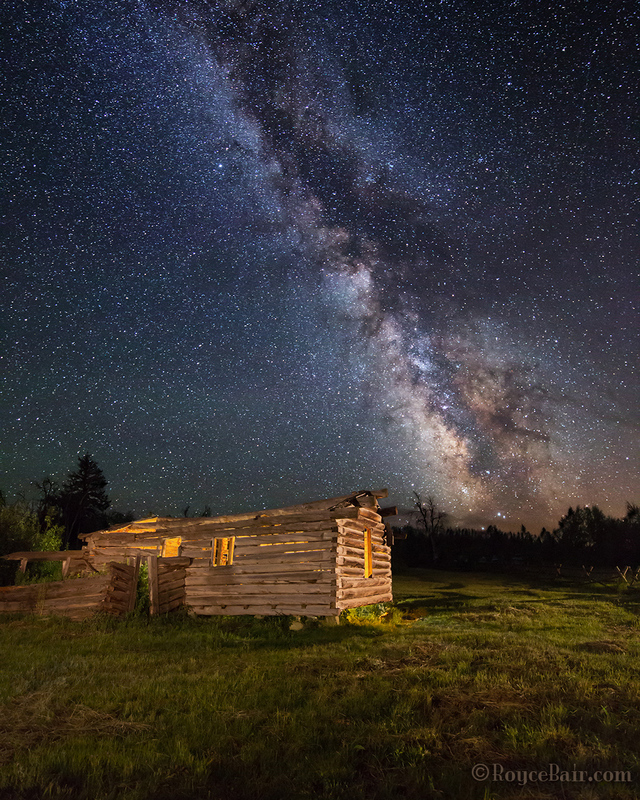 When you are working with high ISO's between 3200 and 6400, you do not need a lot of light to exposure your foreground features. 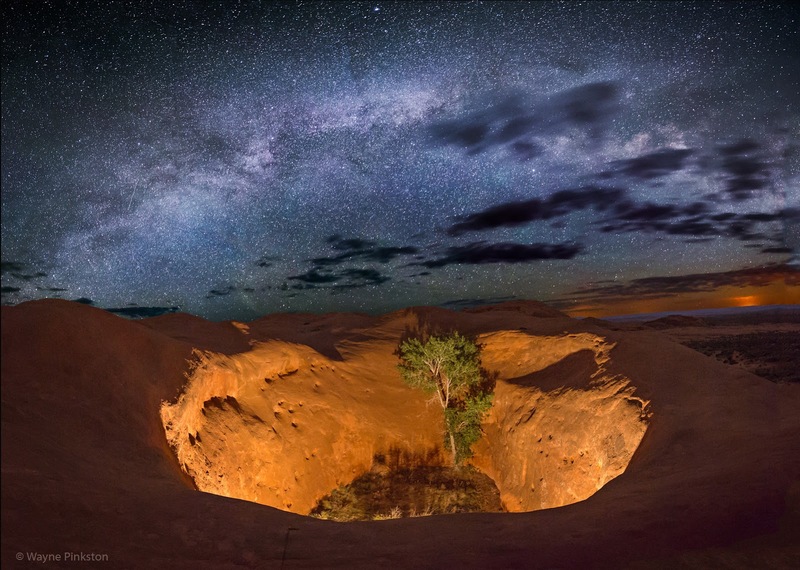 (Wayne Pinkston and I like to call this Low Level Landscape Lighting or LLL. 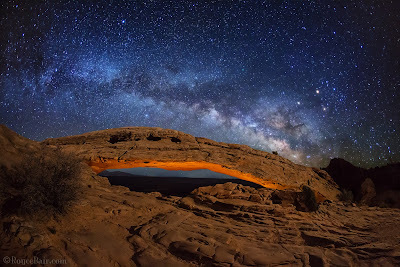 In most cases, we are only trying to match the brightness of the stars.) 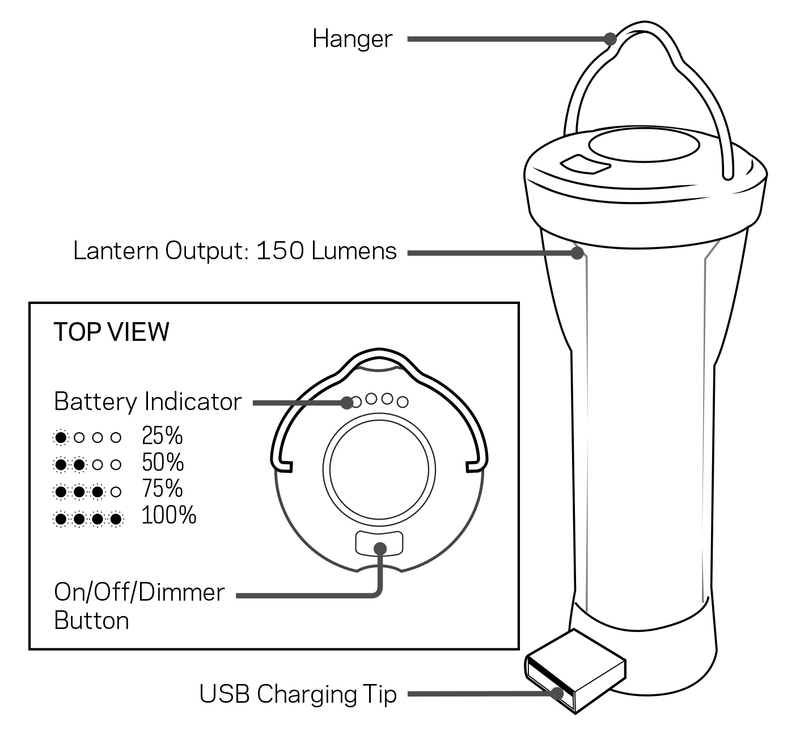 Most LED camp lanterns only have two brightness settings. Even at the lower setting, I typically have to wrap several layers of translucent, white cloth around the lantern in order to make these older lanterns dim enough for NightScape style photography. 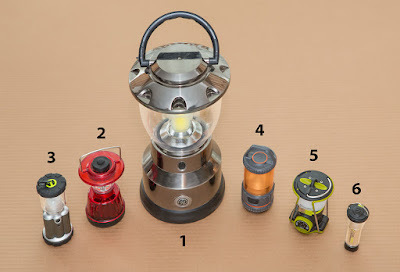 LED Camp Lanterns Compared 2011 - 2016: 1.) GE Chromalit 3D lantern, circa 2011. 300 lumens output, powered by eight D-cell batteries (very heavy), but could last for up to 200 hours in its low setting. All of the following are considered "mini" lanterns, except for #6, which is a "micro" lantern. 2.) Life Gear Glow lantern, circa 2012, white (very blue) and red LEDs, 25 lumens. 3.) 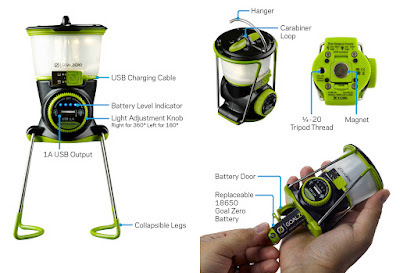 CREE XLamp Warm White LED Camping Lantern, circa 2013. Output 110 lumens on high. The low setting is capable of 48 hours run time, using 3 AA batteries. It's light usually warm enough to not require filtration, but even at low power it often required several layers of white fabric to dim it enough for starry night photography. 4.) Ozark Trail LED Lantern, circa 2014. This original Walmart product produced 50 lumens on high (the current model produces 75 lumens). Its 25 lumens low setting allowed it to run for 28 hours on 3 AA batteries. It is show here with an orange conversion filter that I’ve wrapped around it. Even with it’s low setting, the lantern usually requires 2 to 4 layers of white fabric for dimming. This lamp was used in the top photo of Mesa Arch—hung from a 20-40 feet of rope until the underneath glow of the arch look right. 5.) 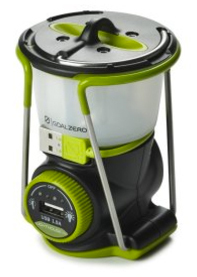 Goal Zero Lighthouse Mini Lantern, 2015. (See full description below.) 6.) Goal Zero Lighthouse Micro Lantern, 2016. (See full description below.) Click image to enlarge. My two favorite LED camp lanterns. 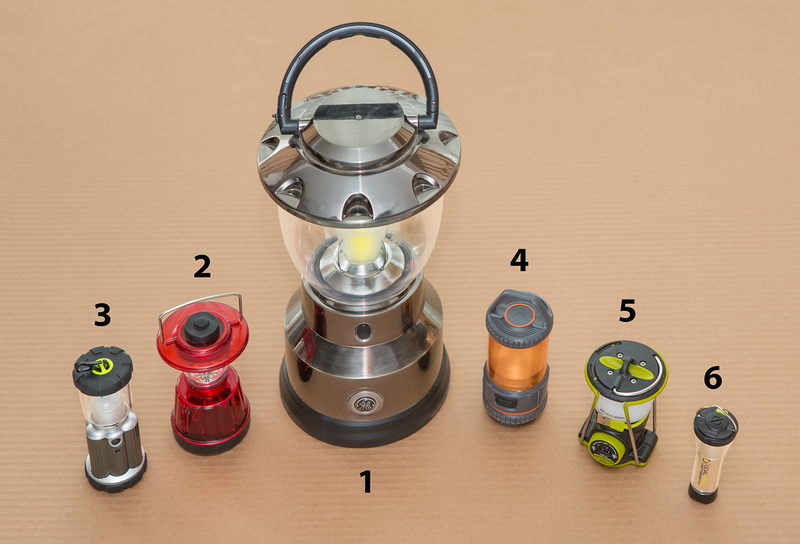 Recently, I have begun to use some of the newer miniature camp lantern lights that have been appearing on the market. Two of my favorites are both made by the incredibly innovative Goal Zero, the "Power-Anything-Anywhere" company. 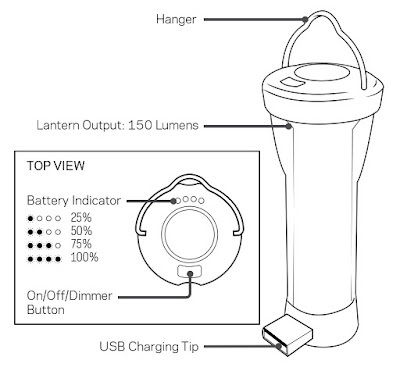 These preferences are the Lighthouse Mini Lantern and the recently introduced Lighthouse Micro USB Rechargeable Lantern. FREE SHIPPING Alert: Receive Free Shipping for a limited time only on orders of $49+ at Goal Zero. Offer Valid 3/27/17 12AM MT - 3/29/17 11:59PM MT. Superb work. You have created such an amazing art. I’m going to recommend this to my friend, who have great interest in it. 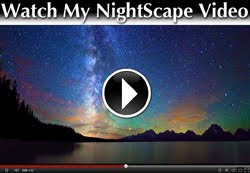 Thanks so much for hosting me on your blog today.thanks. Wow,it's really amazing and necessary. I think it's helpful for everyone. Thanks for sharing. Find the best deal on solar wall lights & solar motion sensor light outdoor. Get the best solar motion light, outdoor solar lights, solar motion sensor light outdoor, solar security lights, solar sensor lights, solar wall lights, solar deck lights & solar powered lights at amazon.com from great selection at Sogrand Industry Inc Store. Great post, it’s amazing, thank you for sharing such wonderful information. Solar security lights, - Get the best deal on solar motion lights, solar motion sensor light, solar security lights, solar motion security lights, solar garage lights, solar door lights, solar wall lights, solar sensor lights, outdoor garage lights & outdoor motion sensor lights at amazon.com from great selection at Sogrand Industry Inc Store. solar wall lantern - Get the best deal on solar wall lights, solar wall lantern, solar wall sconce, solar wall lamp, solar fence lights, solar stair lights, solar step lights, solar deck lights, solar deck post lights & solar fence post lights on amazon.com from great selection at Sogrand Industry Inc Store.